The verb in French for sigh, long (for) is the Regular er verb soupirer. To remember this imagine: you sigh that the SOUP is SUPERIOR! Improve your French vocabulary learning by using picture memory triggers for greater recall of new French words and concepts! ... then check out more on this word below the verb table. Imagine you sigh that the SOUP is SUPERIOR.. The French verb for sigh soupirer is a Regular ER verb conjugated using the same pattern of endings as 5,000+ other Regular ER verbs. Learn to conjugate soupirer and it will reinforce the pattern for ALL Regular ER verbs, these being the most common French verbs. ✔ You can more easily remember words and verbs like the French for sigh soupirer using the techniques of the world's Memory Masters. 200 Words a Day! 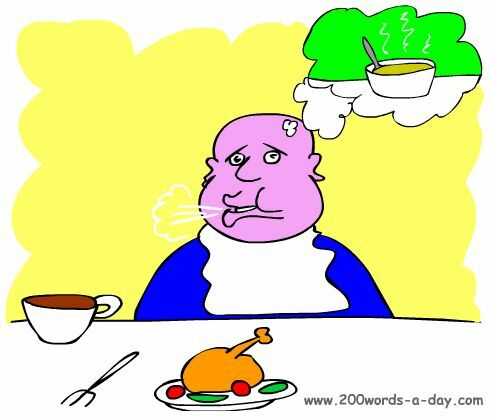 Free Daily French Lesson Online - the verb in French for sigh soupirer - fully conjugated. French Learning Made Fun and Fast with your free newsletter Verb Lesson - soupirer - the French for sigh.